In communities across the country, residents are seeking safe, accessible, and affordable places for exercise and play. Shared use is a practical solution because it allows people to exercise and play at existing recreational facilities, such as playgrounds, walking trails, and gymnasiums. In support of shared use efforts, public and private property owners are broadening or opening access to underutilized facilities for public use. And increasingly, communities are looking to shared use as a way to create opportunities not only for exercise but also for other activities, such as gardening, cooking, and community engagement. An adaptable, cost-effective strategy, shared use can promote physical activity, equity, and health. 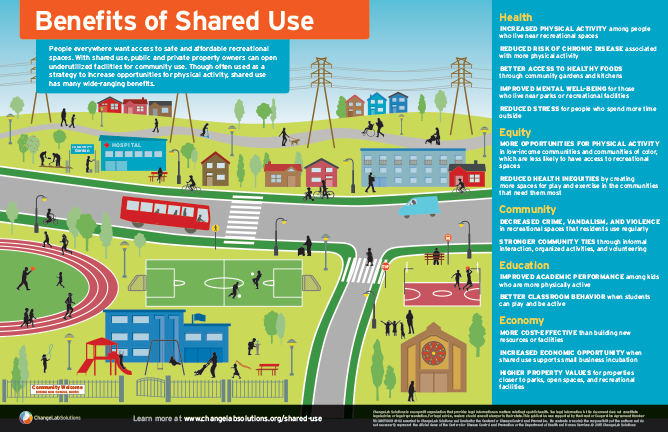 This infographic illustrates how shared use can have broad benefits that touch public health, the economy, the environment, the educational system, and civic life. Check out all our shared use and joint use resources for more information, and contact us for help developing the best shared use arrangement for your community.